Ministers to get a 3rd pay hike. What about the elderly? Whose future is “shining”, really? Mdm Soh (not her real name) is more than 70 years old and has been working as an office cleaner for more than a year. Her daily routine starts at 7am and ends at 5pm, which means she puts in 10 hours of work, including a one hour lunch break. She works five and a half days per week – 55 hours in all. She is paid $650 per month. In January 2008, the Minister for Health, in advocating for the implementation of means testing starting at the median income, cited the figure of $2,170 for full-time employed residents. Mdm Soh clearly is not in this income bracket, even though she works full time. Mdm Soh says that she started work when she was 10 years old, doing various jobs over the years. Although she finds life tough with the current rate of record inflation, she declines help from her children. “They also have their families,” she says. “I’ll just make do with what I have. I don’t go out except for work and maybe once in a while I buy a little 4D”, she says in Teochew, referring to the lottery. She quickly adds that she spends “at the most just one dollar’s worth” on the lottery. Under the revised salary package announced by the Public Service Division (PSD) on Thursday, ministers at the starting grade will take home $1.94 million next year – an increase of 21 per cent over this year’s $1.6 million. 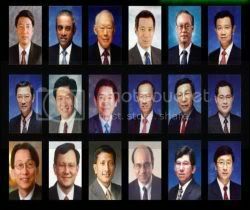 With the pay revision, the annual salary for President SR Nathan will go up from $3.1 million this year to $3.87 million in 2008, the Prime Minister’s from $3.09 million to $3.76 million, ministers and senior permanent secretaries, from $1.593 million to $1.94 million, entry superscale grade Admin officers, from $384,000 to $398,000 and MPs, from $216,300 to $225,000. The Prime Minister’s salary was increased by $670,000 per year. That is about $55,833 per month. The PM’s salary is currently $3.76m per year ($313,333 per month). “The proportion of Singapore residents earning less than S$1,000 (US$690) a month rose to 18 percent last year, from 16 percent in 2002, central bank data released late last month show… and Singapore’s Gini coefficient, a measure of income inequality, has worsened from 42.5 in 1998 to 47.2 in 2006, and is now in league with the Philippines (46.1) and Guatemala (48.3), and worse than China (44.7), data from Singapore’s Household Survey and the World Bank show”. Salaries at the MR4 Grade are currently at 55% of the benchmark. Given the large gap, it is not realistic to close the gap fully in one go. Instead, we will close half of the current gap, that is, from 55% of the benchmark, to 77% of the benchmark by the end of this year. This will be effected in two steps – one step now, and another step at the end of this year. Next year, we aim to close half of the remaining gap, bringing salaries to 88% of the benchmark by end-2008. Yet, with the anticipated third increase in ministers’ salaries, which is already the highest in the world, Singaporeans are beginning to wonder if only the top few are reaping the rewards of the hard work which everyone had put in during the boom times. As was asked in an earlier article on TOC, “Why have Singaporeans, with one of the highest savings rates in the world, become so dependent on government handouts to even just get by?” With regards to the latest handout as reported by Channel NewsAsia, Over 780,000 households to receive $134m of utility rebates, one wonders why such a huge number of Singaporean households need such handouts to pay their utilities. 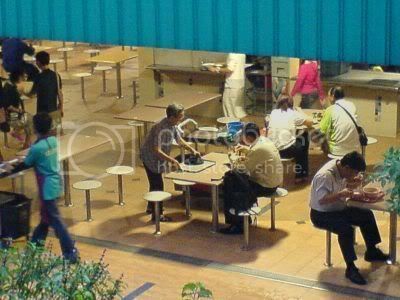 Have Singaporeans, consistently ranked one of the hardest-working and overworked, suddenly become beggars with hands extended towards the Government all the time, even as they continue to strive and compete with foreigners? Perhaps it is time to seriously consider a more institutionalised approach to closing the income gap, such as having a minimum wage policy, and give Singaporeans, especially the working elderly such as Mdm Soh, a sense of security and peace in their twilight years. This is more pertinent now as the Government is also encouraging Singaporeans to work for as long as one can. Minister Lim Boon Heng even urged Singaporeans not to think of retiring (Channel NewsAsia). To have someone like Mdm Soh work for $2.95 an hour is, in all honesty, quite shameful for a country which regularly trumpets its economic achievements. But more importantly, it says something about how we value those who have given practically their entire lives helping Singapore become this “world-class” city which the Government now boasts about. While chatting with Mdm Soh, she was very anxious not to be seen talking to me too long. “I have to get back to work, or else my boss will be looking for me”, she would periodically say. I could not help but wonder: Are our elderly so frightened of not being able to find jobs that they would accept any jobs offered to them, even if they do not pay them fairly? I believe that local workers deserve to have an adequate salary for a hard day’s work. This salary has to be commensurate with the cost of living. It should be adequate for a worker to feed a family, at least in a frugal way. The worker should not be expected to work for 12 hours a day, and still not earn enough for the family. Indeed, our elderly who put in full-time work should not be struggling to keep up, or made to work for less than what would be minimum wage, all in the name of “globalisation” or “competition”. Otherwise, ministers should be prepared for a severe backlash if and when they increase their own salaries later this year – the third time in two years – by millions of dollars again. It seems that this “golden era” which MM Lee declared we are in is only for a select group – and we also wonder whose future it is that is “really shining”. Elderly toilet cleaners a sad reflection of society here. I REFER to the article, ‘Contract workers: Caught in the pay squeeze’ (June 8). The Building Custodian Job Re-design Programme, an initiative supported by the Workforce Development Agency and National Trades Union Congress, seeks to enhance the skills of cleaners to value-add in work such as changing light bulbs, clearing blockages and ‘custodial checking’, such as sighting and reporting defects, pests and killer litter. This job of building custodians or multi-skilled cleaners comes with a $1,000 starting wage, compared to a cleaner’s $700 to $800. As I understand most cleaners are elderly with low education, how realistic is it to expect them to undergo re-training to expand job duties and responsibilities? How many companies have sent cleaners on this re-training programme? How many of the 37,000 contract cleaners have so far been sent for re-training? As most cleaners are employed by contractors which have to bid for contracts at the lowest competitive price, how likely is it that one paying the lowest wage of $700 will pay the $1,775 course fee and allow time off for the 112-hour course? With regard to the advisory to all companies and contractors on responsible outsourcing practices issued by the Ministry of Manpower in March, I have come across an elderly road sweeper, an 84-year-old Singaporean man who works 55 hours a week for $650 a month, and an elderly woman who works 24 hours a week as a housekeeper at a community club for just $300 plus a month – no wage increment, bonus and so on. Government agencies, statutory boards, government-linked companies and so on should take note of the very low wages of workers on their premises, and try to influence their outsourced contractors to pay decent wages. For example, they could follow the example of the PAP town councils, which have recommended a $1,000 starting wage for full-time workers and $500 for part-time workers, in new cleaning contracts since April. Although no minimum wage is imposed, cleaning companies are required under the new contracts to send their workers to the National Skills Recognition System Clean Residential Estates course.